Dwight Eisenhower was the Supreme Commander of Allied Forces in Western Europe during World War II. He planned and led all major operations in the Western European Theatre of Operations, with OVERLORD, the Allied invasion of Normandy beginning 5/6 June 1944, the biggest of all. He went on to lead the newly formed NATO, and served two terms as President of the United States. And, you can see his toilets, both Presidential and personal. The North Atlantic Treaty Organization or NATO was formed in April, 1949. SHAPE, the Supreme Headquarters Allied Powers Europe, was formed as a consolidated command structure in January 1951, with Eisenhower as its Supreme Allied Commander. In 1952 and 1956 he was elected to two terms as President of the U.S.A.
During his years as President, Eisenhower owned a farm near Gettysburg, Pennsylvania. He used it as a personal retreat and a place to meet with other world leaders like Winston Churchill (whose chamber pot I have on another page), De Gaulle, and Krushchev. The house is very much in the style of the 1950s and 1960s. It is much as if they just stepped out to go to the grocery store, it has a very "lived-in" feel. Shelves are filled with his books, and look at this, they had monogrammed towels in the bathroom. Presidents Roosevelt and Truman had both used transport aircraft: Roosevelt had the Sacred Cow and Truman the Independence. 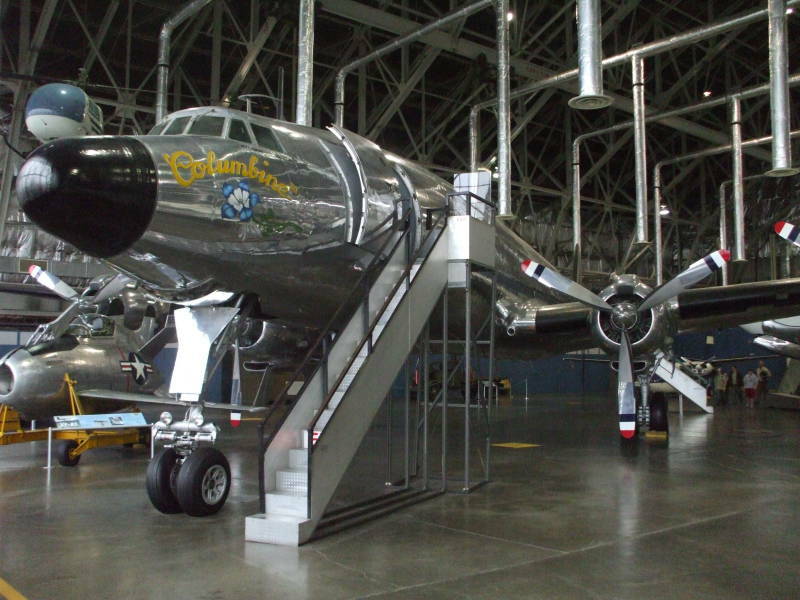 Following the emerging pattern of upgrading the Presidential transport aircraft with each new man to hold the office, Eisenhower used the Columbine II and Columbine III. His original Columbine had been his World War II transport, and Columbine II his first Presidential transport. 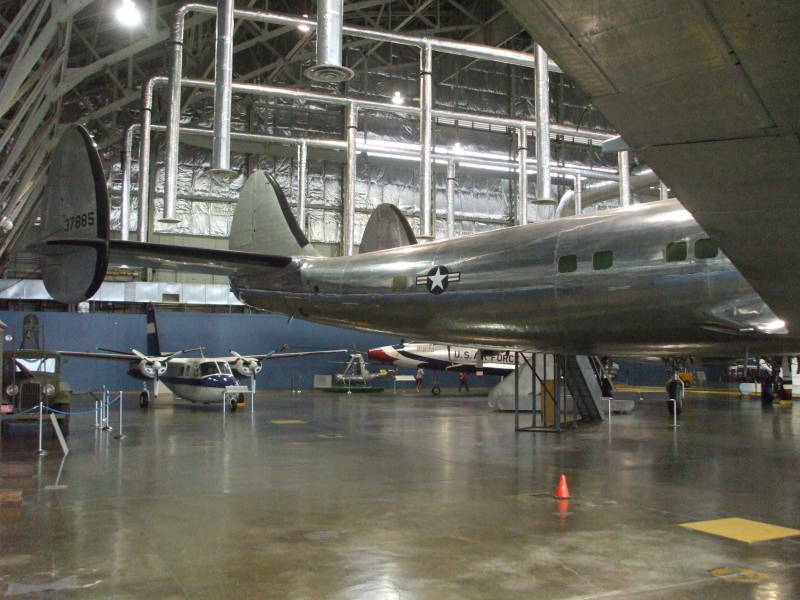 Columbine II and Columbine III were Lockheed C-121 Constellations. The last was designated as a VC-121E to reflect its modifications and VIP transport status. Columbine III had four Wright R-3350-91 engines producing 3,250 horsepower each, providing a maximum speed of 299 mph, a range of 4,250 miles, and a service ceiling of 25,000 feet. The executive cabin was in the rear. 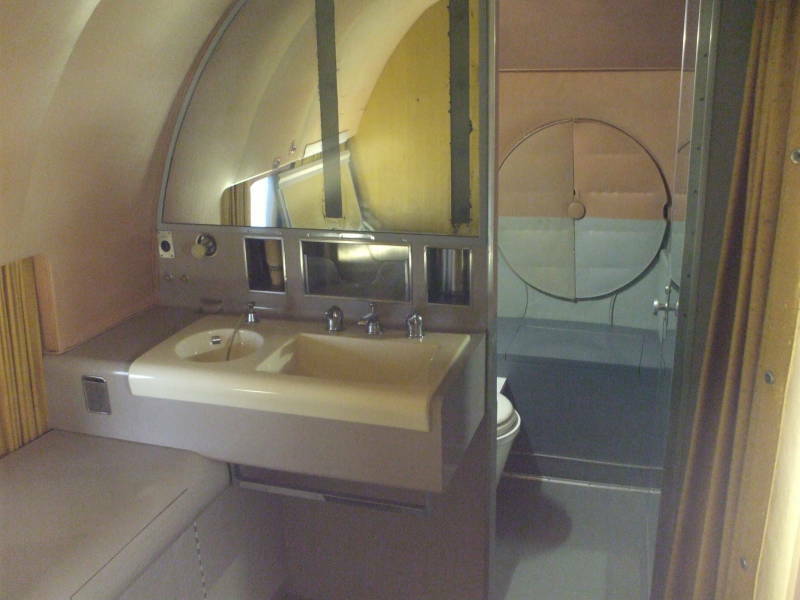 Here we see the executive lavatory area. We're looking back, the curved bulkhead to the left is the right side of the fuselage. Eisenhower brought some upgrades to the Presidential aircraft, including teletype, television, and improved air to ground voice links. The number of staff and press corps accompanying the President also continued to rise. 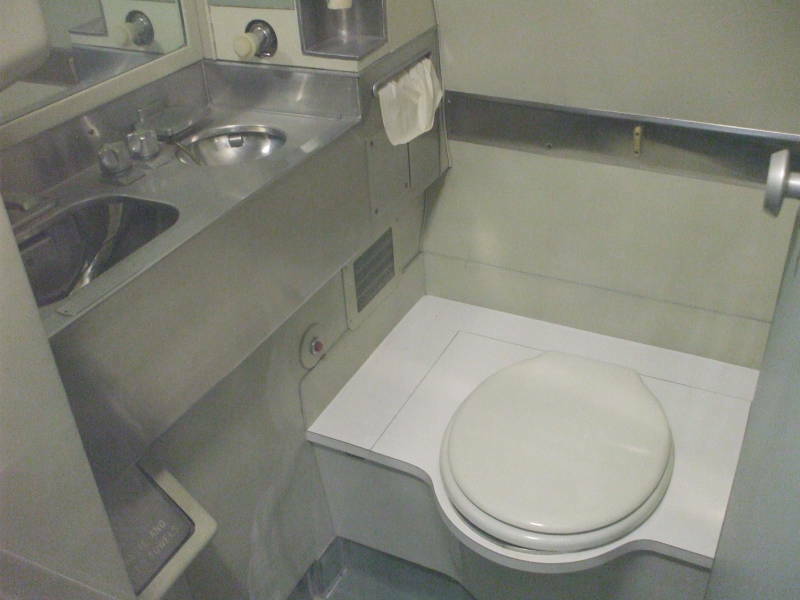 Here we see a staff and crew lavatory on board the Columbine III, very similar to what is found on present commercial airliners. Eisenhower was the first President to fly under the callsign of Air Force One, because of an incident in 1953. An Eastern Airlines commercial flight, Eastern 8610, was using very nearly the same callsign as the Presidential flight, Air Force 8610. The airliner accidentally entered the same airspace given the confusingly similar callsigns. "Air Force One" was introduced informally for Eisenhower's Presidential aircraft, becoming official practice only in 1959.